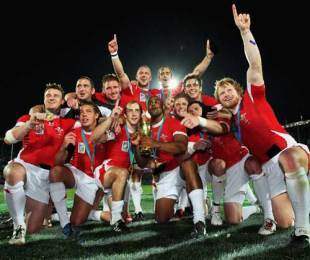 The Rugby World Cup Sevens could be scrapped in favour of the Olympics by the 2016 games if the IRB are successful with their presentation to the Olympic executive board in Lausanne next month. IRB chief executive, Mike Miller, confirmed the move as the sport aims to compete with golf, karate and squash among others for two available places in the 2016 Olympics. Miller said: "One of our key messages to the executive board is that the success we saw in Dubai at the Rugby World Cup Sevens is what we would be giving to the Olympic movement." "If we were to be re-included in the Olympic Games our intention would be to stop the World Cup Sevens, so there would be one pinnacle in a four-year cycle for rugby sevens and that pinnacle would be the Olympic Games." Under the board's plan the eight-leg IRB World Series - which heads to Edinburgh this coming Saturday - would become a qualification event for the Olympics. The 2009 World Cup featured a 24-team men's tournament and 16-team women's event, although the International Olympic Committee would decide the format for an olympic event. The IRB see the Olympics as the best vehicle with which to grow the sport in any form - but they also believe the game's commercial pulling power would be valuable to the IOC. The Sevens World Cup in Dubai attracted a cumulative crowd of 78,000 and was broadcast to a global television reach of 760million people in 141 nations. The IRB also stated those figures showed a significant growth in the traditional non-rugby markets of Asia, Africa, north and south America. The board will also argue in their presentation to the IOC they can attract a younger audience which is one of the aims of the committee. "Sevens is already a huge sport in other multi-sport events. Rugby fans travel and they travel in numbers and they will go to see other events as well," said Miller. "We feel we can help them achieve one of their aims which is to remain relevant to younger sporting fans." The IRB's last bid for re-inclusion in the olympics failed in 2005 following criticism they had not done enough to grow the women's game on a worldwide basis. But the success of the inaugural Women's World Cup in Dubai is understood to have impressed at least one of the two IOC delegates who attended the event. IRB chairman Bernard Lapasset, who has travelled extensively since the Beijing Olympics to push rugby's case, said: "The feedback I have received has been very encouraging."